The service charges that are being brought in north and south of the border are part of a process of further increasing the proportion of tax paid by workers. The trend in global capitalism is to replace 'progressive' taxes (like income tax) with flat-rate taxes (like VAT, service charges, etc) to further shift the taxation burden from rich to poor. This is the policy advocated by the world bank, IMF, WTO and virtually all of the institutions of global capitalism. Rudolf Rocker is recommended by Chomsky, whose own anarchist thinking is strongly influenced by him, as one of the best writers on anarchism and this is probably his finest work - a brilliant libertarian analysis of the development of power, the cult of the state and their relationship with human liberty and culture. Every so often the newspapers fill with stories of a crisis in some third world country. We see pictures on our screens of gunmen, starvation and suffering; inevitably we hear calls for humanitarian intervention. Over the summer, we were told of a crisis in Liberia. A brutal civil war, a corrupt leader, child soldiers, starving civilians: it seemed that the whole world was crying out for intervention by the US or UN. The NEFAC web page is to be found at http://nefac.northernhacking.org/ This would be my first and only major problem - well niggle really. Basically its not the most obvious or intuitive address. On the other hand it's the first thing that comes up when you put "North East Federation of Anarchist Communists" into google. (They are located in the US and Canada). Mutual Aid is the fuel an anarchist society will run on. It is also what keeps capitalist society going in spite of all the hardship, greed, and exploitation that exists. Like all good ideas it's simple to understand. In order to get by in a tough world, it's necessary to get a bit of help from others. And as well as receiving help you also give it, not simply because it's nice to be nice, but because you know that sometime in the future you'll need a bit of it yourself. In this issue of our magazine, we continue our tradition of dealing with the pressing issues of the day for anarchists and libertarians, and for all who are seriously interested in bringing about a new society. We carry articles by a member of the North Eastern Federation of Anarcho-Communists in relation to the future of the Black Bloc, and another by a member of Doctors For Choice on abortion rights (or the lack of them!) in Ireland. In Britain the 'Effects of Taxes and Benefits on Household Income' report revealed that, under Thatcher, 1979-90, the fifth of the population with the lowest incomes had their share of post-tax national income cut from 10% to just 6%. The richest fifth increased their share of post-tax national income from 37% to 45%. As we go to print, the bin charges battle has started in earnest in Dublin with Fingal Council's attempt not to collect non-payer's bins. Trucks have been blockaded across Fingal forcing the council to cancel all collection services. Elsewhere campaigns are gearing up to blockade trucks in solidarity with Fingal or when the other Dublin councils attempt to implement non-collection. 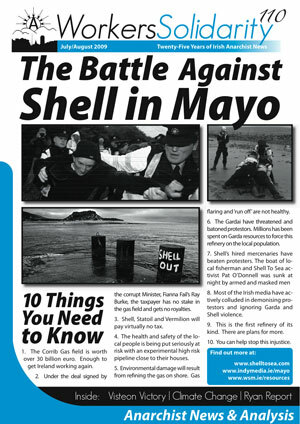 In our next issue we hope to report in full on how the councils were defeated. In the meantime you can follow events on our web page. Below we report on South Dublin's council attempts to con households into paying. The last year or so has seen a hectic period for activists in Ireland. From the May 6th Gardai attack on Reclaim the Streets in Dublin, through the anti-war campaigns, people have been coming into conflict with the state. In Dublin, we are now in the middle of a struggle with local anti-bin tax groups across the city taking action to defeat the councils refusal to collect rubbish. We are often told that ignorance of the law is no excuse, but what are we to do when nobody will say what the law means. The High Court in Belfast has said NO to a request that it spell out what is legal and what is not. The Family Planning Association had asked it to order the Department of Health to publish guidelines about when abortion is legal in the six counties. The 20th anniversary of the anti-choice referendum of 1983 saw the launch of a new pro-choice campaign, 'The Alliance for Choice' launched in Dublin. Since 1983 over 100,000 Irish women have had to travel to England for abortions.